India is often known for majestic temples like the Taj Mahal and the colorful silk saris, song and dance of Bollywood films. But as one of the world’s oldest civilizations, and second largest in population with 1.3 billion people, it’s a country comprised of many languages, ethnicities, customs and religions. Learn about India’s history with the timeline below; then read about the country’s rich, diverse culture. 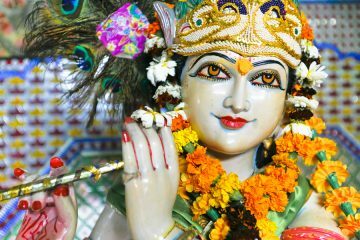 Statue of garlanded Hindu god Krishna playing flute in Delhi, India. 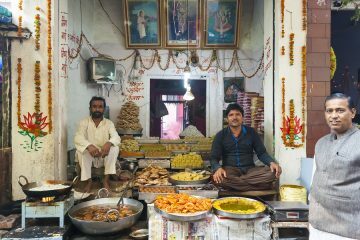 India is home to a strict, centuries-old and complex social stratification system that determines one’s worth by the caste they’re born into. The higher the caste, the better the jobs, quality of life and level of respect received in society. The lower the caste, the more one is subjected to violence and poverty. The Dalit—also historically known as “untouchables,” are viewed by many as the lowest of the low. While the non-violent civil disobedience led by Mahatma Gandhi and subsequent affirmative action have contributed to increased rights and social advancement possibilities for lower castes and the Dalit, conflict between them still exists. India is the birthplace of Hinduism, a religion the majority of the country practice. At a distant second, around 14 percent of the population adhere to Islam, followed by Christianity at around 2 percent. And although Buddhism was also established in India, not even one percent practice it there today. Indians traditionally adhere to a joint family system of many generations living together with a male at the head of household, although urbanization and globalization have started to splinter the custom. Similarly, for centuries, arranged marriages—within one’s caste—have been the norm with many girls marrying before they’re eighteen. “Love marriages,” however, are increasing. Both Indian men and women dress modestly, covering legs and shoulders with loose-fitting clothing. It’s common to remove one’s shoes before entering a home, temple or even some businesses. India, Govardhan, November -06-2016:Street Food Vendors cooking and selling food stuff. Cuisine varies in homes across India, but most meals star flavorful spices and curries. Other staples include vegetables, potatoes, rice, yogurt, and lentils, often eaten with thin breads like naan that serve as a utensil. Lamb, other meats and fish are also consumed. 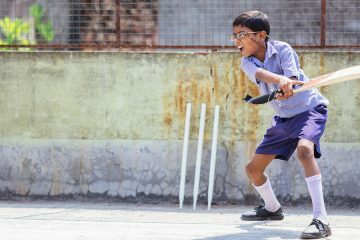 Indians enjoy playing and watching cricket and field hockey, and excel in it internationally. Football (soccer) is also popular, and while yoga was invented in India thousands of years ago, it’s not as commonly practiced in the country today as one might think. A range of holidays are observed throughout the year in India, but three national holidays include Independence Day from British rule, Republic Day celebrating the adoption of the constitution, and Mahatma Gandhi’s birthday. Despite being one of the fastest growing economies in the world, over 91 million people live in extreme poverty. About half of jobs are in the agriculture sector, and are dedicated to producing goods such as milk, rice, wheat and sugarcane. Beef is also a part of the economy, although religious objections in recent years have led to bans on the slaughter of cows in many areas. Jobs in manufacturing and construction are also prominent–around 11 percent of the economy respectively. I am doing a huge report on India and the influence of Gandhi. This was a big help. Thanks! India is a very unique place.